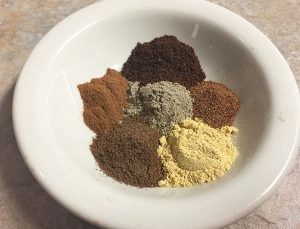 Spice up some homemade chex mix with chai flavoring! One of my favorite drinks is a dirty chai latte- doesn’t matter the season. Therefore, anything with chai spice flavor has me hooked. 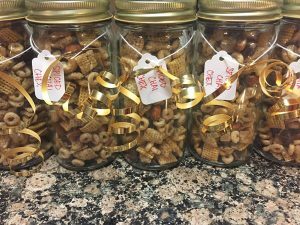 For Christmas gifts each year I make a snack to hand out to family. 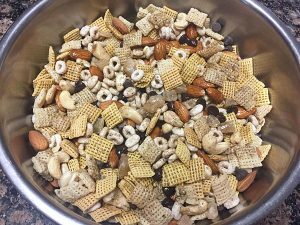 Last year I made this winter puppy chow and it was a huge hit! I wanted to try something new this time around and was feeling pretty creative. The final outcome was orange-vanilla spiced chai flavored chex mix! Chai spice was so easy to put together! Now I have some stored for future use too. I found the recipe here but nixed the pepper for this. 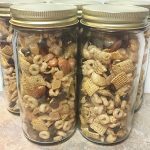 For this homemade chex mix recipe I used corn and rice chex plus some frosted cheerios since it is winter time! 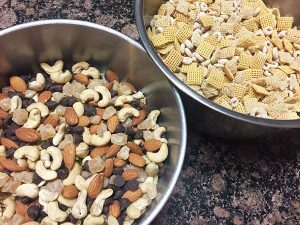 My add-ins were cashews and almonds, dried pineapple and chocolate chips. For my glaze I chose to use coconut oil to keep this snack healthier. I didn’t want to add any extra sugar so I went with agave too. To give a subtle hint of another flavor with the chair spice I used a little orange juice and vanilla, which turned out to be a wonderful combination! Start by melting the coconut oil and then mix with the agave, orange juice and vanilla. Add the spices. Pour the wet mixture over all of the dry ingredients (excluding chocolate chips) and stir until fully coated. Spread over parchment on a baking sheet and put in oven at 250F for about 45 minutes. Make sure to stir every 15 minutes. Note: If you mix in the chocolate chips first then DO NOT put this in the oven! Instead, freeze for about 30 minutes and then put into storage containers. I almost made this mistake the first time around! Let cool completely, combine the chocolate chips and then store in an air tight container. I chose to put mine in recycled kombucha bottles! 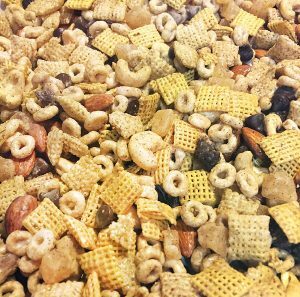 This chex mix will keep for a little while longer if put in the fridge after a few days. I did this with those that I wasn’t giving to people right away since I made it in bulk. Homemade chex mix with chai spices and orange-vanilla flavoring. Melt the coconut oil and then mix with the agave, orange juice and vanilla. Add the spices. Pour the wet mixture over all of the dry ingredients (excluding chocolate chips) and stir until fully coated. Let cool completely before combining with chocolate and then store in an air tight container. If you mix everything together at first you can freeze this instead so the chocolate will not melt in the oven. Just put in the freezer for about half an hour before putting in storage containers. This holiday recipe is definitely on the lighter side with no added sugar and healthy fats. Snacking on guilt-free homemade munchies with a spiced chai flavor might just be my new addiction! It took a lot of restraint to put all of this in giveaway jars instead of just indulging…. Oh this looks amazing for NYE! I love putting out chex mix for everyone to munch on before the real food. Thanks for the great recipe!